Nestled away in one of the many side streets of Penzance Town centre is our quaint bed and breakfast, Honeydew Guesthouse. We are situated only 2 minutes from the main train and bus stations of Penzance and 5 minutes from both the Scillonian ferry and Airport links to our neighbouring Isles of Scilly. We have lived locally for most of our lives so have a wealth of knowledge about Penzance and the surrounding areas. We pride ourselves on offering a very warm and relaxing atmosphere to our guests, doing our utmost to make your stay here in Penzance as charming as it could possibly be. All of our guest rooms are en-suite with a shower cubicle, apart from our single room, which has a separate showeroom/toilet that it may need to share with a double room. All rooms have flat screen digital televisions, hot drink making facilities, and include hanging and cupboard space for your luggage. You will have your own front door and room key to come and go at your pleasure so there are no restrictions on time keeping, we just ask that you respect the other guests. 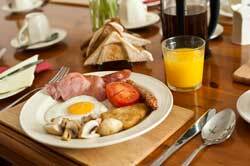 A full breakfast menu sourced from local suppliers is available, and cooked beautifully to your preference. All special dietary requirements are catered for with prior notice. We are happy to book taxis and restaurant reservations for guests. Luggage transfers for those that are walking the Peninsula can also be arranged. Unlike many other Bed & Breakfasts we do cater for those guests wishing to stay for just one night. We do welcome guest’s dogs if confirmed upon booking. The Penzance town centre with its individual shops and restaurants is literally on our doorstep. Perfect to stroll through the winding streets and then to sit and have a coffee whilst admiring the amazing architecture of Chapel Street. Cornwall has many beautiful walks for everyone to enjoy. We are ideally situated for walking the local coastal and foot paths. There are a selection of walking and local attractions leaflets for the area in our breakfast room for you to browse. We are on hand and happy to help if you need any more information or advice as we have both lived locally for many years so have a wealth of knowledge about Penzance and the surrounding areas. We have some of the most beautiful beaches in the surrounding areas, Sennen, Porthcurno and Praa Sands to name a few, all a short bus journey away, all renowned for their cleanliness, and very popular with Watersports enthusiasts. There are several beautiful and historic attractions also nearby including the famous St Michael's Mount, the Minack Theatre, the Eden Project and of course Lands End. The Penzance Harbour is a small stroll from us, which leads onto the Penzance Promenade. Here there are many parks and gardens, and the well renowned outdoor swimming pool ‘The Jubilee Pool’, an excellent way to enjoy the sunshine without getting sand inbetween your toes! We offer a packed lunch service if you require one to save you the expense and hassle of finding somewhere to eat- especially if you are taking a coastal path walk for the day. This can be booked initially with us. The Penzance area is an abundance of wildlife. Many people visit Penzance each year in the hope of catching a glimpse of the variety of birds which come to the area. Marazion Marsh R.S.P.B Reserve is situated on the outskirts of Marazion. Well worth a visit with binoculars. Being situated close to the harbour, we are also convenient for those wanting to take fishing trips out into Mounts Bay, these can also be arranged for you with prior notice, or we can point you in the right direction. Cyclists are very welcome to stay with us, and we can provide shelter for your bikes overnight. Some of our guests have posted reviews on the Trip Advisor website, if you are interested you can take a look at our reviews here.